Voices from the Field features contributions from scholars and practitioners highlighting new research, thinking, and approaches to development challenges. This piece is authored by Madison Schramm, Hillary Rodham Clinton Research Fellow at the Georgetown Institute for Women, Peace & Security. Voices from the Field features contributions from scholars and practitioners highlighting new research, thinking, and approaches to development challenges. This piece is authored by Madison Schramm, Hillary Rodham Clinton Research Fellow at the Georgetown Institute for Women, Peace & Security. This post was cross-posted on the GIWPS Blog. In the past few months, Iranian women have been arrested for dancing and detained for riding bicycles. Why do women’s seemingly benign actions generate such backlash from the Iranian government? Women’s bodies are supposed to be subjects of the state—used by the government to project a desired societal image. But women in Iran are increasingly defying restrictive laws and fatwas—and leveraging the power of social media to challenge state control. Regulating women’s bodies is a common practice internationally. In a number of European countries, there is an effective ban on niqabs and burkas. Since 2011, women in France have been restricted from covering their faces in public. As Ann Towns has argued, leaders often regulate women’s appearance and movement in an attempt to control the national narrative. In authoritarian states, opportunities to mobilize and organize against state control—of women’s bodies or otherwise— is extremely limited and dangerous. In grossly asymmetrical power struggles, resistance and activism have to take a different form from mass protests or rallies. James Scott has written extensively about some of these tactics in his book Weapons of the Weak, which investigates Malaysian peasants’ resistance through seemingly small individual acts of insubordination, like foot dragging. These tactics are important even though they are often overlooked or minimized. As Scott explains, “Subordinate classes throughout most of history have rarely been afforded the luxury of open, organized, political activity.” Women internationally have long relied on these daily acts of resistance to challenge patriarchal systems. Even in the US, before suffrage, before #MeToo was even dream, women relied on these tactics to challenge power structures. The new state framed these changes as a response to the imperialist restrictions enforced by the Shah, and Reza Pahlavi’s earlier ban of the veil. In both instances, women’s bodies were leveraged as sites of contestation—in the first as a symbol of modernization and the latter as a symbol of the Islamic Revolution. Women face pressure to comply from not only the state, but from family, friends, and religious leaders. Despite enormous pressure, some Iranian women are turning this narrative on their head, using the powerful symbolism of their bodies to challenge the status quo. In Tehran, fashion shows have become part of the social scene. You can find women in colorful dress, wearing jeans to work, embellished shoes, and chunky jewelry, revealing perfectly manicured nails and bangs peeking out beneath the veil. In doing so, they are challenging state control. Others are even removing their hijab, posting pictures on social media. Some women have even tied their hijabs to sticks, waving them as makeshift flags. This resistance puts women at risk of arrest by the morality police or far worse. These actions are powerful. If they weren’t, then why would the state invest so much in stopping them? At a time when women internationally are grappling with how best to resist patriarchal systems working to control our bodies, we can garner insight and find strength in women’s everyday acts of resistance in Iran. 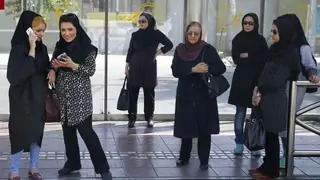 Laws in Iran systematically restrict women’s civil liberties, but many women in Iran are using everyday resistance to challenge the rules that attempt to control them.